Much of what came to constitute China Proper was unified for the first time in 221 B.C. In that year the western frontier state of Qin, the most aggressive of the Warring States, subjugated the last of its rival states. In 221 BC, the first Emperor of China (so-called because all the previous dynastic heads only called themselves kings), Qin Shihuangdi, conquered the rest of China after a few hundred years of disunity. There are two major reasons why he won; the first is that he was a devout Legalist (so much so that he burnt all [at least what he thought were all] the books in the country) and did things like execute generals for showing up late for maneuvers (this was later to prove to be his downfall). 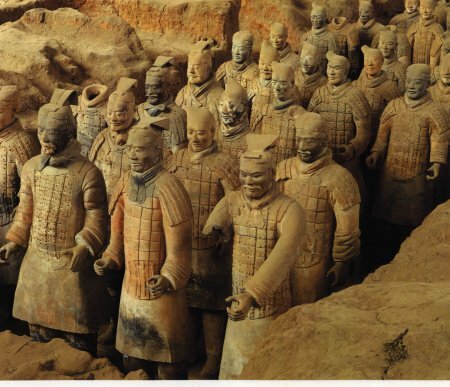 The other reason is because the state of Qin had a lot of iron, and consequently, at the dawn of the iron age, had many more iron weapons than the other armies did. Qin Shihuangdi had a great many accomplishments, not the least of which was the linking together of many of the old packed-earth defensive walls of the old principalities into the Great Wall of China. This is not to say that he built the massive masonry construction that today is called the Great Wall of China; what is today called the Great Wall was actually built close to two thousand years later, during the Ming dynasty. In the year 210 BC Qin Shihuangdi died. It wasn't long before the Qin dynasty fell apart, helped in part by a revolution started by a soldier who, when faced with execution because he was going to be late delivering a group of new draftees (it had been very rainy and the roads had turned to mud), convinced his conscripts to rebel with him (they faced execution as well). And while they eventually were caught and duly executed, the revolution they started ended up destroying the old dynasty and set the stage for the Han. © 2005 ChinatownConnection.com, Houston Chinatown Web Portal. Qin Dynasty. All Rights Reserved.